In the simplest terms, solar panels collect sunlight through photovoltaic (PV) cells and convert the light’s energy into electricity. How they deliver converted energy varies depending on the application. 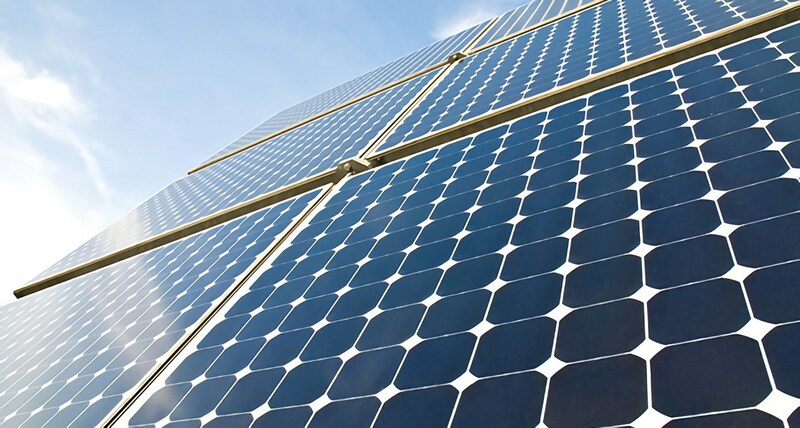 PV cells consist of two plates of semiconducting material, commonly made of silicon. Silicon has some special chemical properties that make it an ideal neutral platform for transmitting electrons. However, pure silicon would not generate any electricity, as there is no positive or negative charge. Hence, other elements are added to give each plate a positive or negative electrical charge. Silicon atoms have room for 8 electrons in their outer shells, but only carry 4 in their natural state. One plate can be negatively charged by combining phosphorus with silicon (adding 5 electrons), while the other one can be positively charged by combining boron and silicon (adding 3 electrons). Whereas the phosphorus/silicon plate has an “extra” free electron, the boron/silicon plate has one spot left. The panels are joined together with wires for conduction running between them. Ultimately, the 9th electron in the phosphorus/silicon plate breaks free when photons from the sunlight strike the panel. At the same time, the silicon/boron plate draws this knocked-off electron to fill its open slot. Electricity is created as the sun’s photons continue to break off electrons. The collector itself consists of rows of insulated glass tubes that contain copper pipes. Water is heated within the collector and is then sent through the pipes to the water tank. While this is the most efficient collector, it is also the most expensive. The dark flat plate panel has an insulated cover that absorbs heat and then transfers the energy through copper or silicon tubes to the water tank via a liquid containing antifreeze. The plate also features an insulated backing. This collector is cheaper, yet less efficient. These new panels don’t use solar radiation to heat up heat transferring liquids; instead, they have a refrigerant passing through them that absorbs the heat. When the heat passes through the panel, it turns into gas, which is then compressed, thus raising its temperature. The gas passes over a heat-exchanging coil in a hot water cylinder. This new system could theoretically generate heat year round, as it doesn’t depend on optimal weather conditions. Solar air heaters are used for space heating, and are the most efficient and affordable collector option. A glazed collector has a transparent top layer and an insulated frame and back panel to prevent heat loss. An unglazed collector has an absorber plate over which air passes while heat is being absorbed. The bowl collector has a fixed mirror that focuses the sunlight in one spot. A parabolic dish, on the other hand, features a tracking mirror that tracks the sun’s movement. The latter is much more cost-intensive. Solar technology is an evolving field. Modern solar technology solutions are smaller and more efficient than past generations. In 2013, for example, researchers at the Stanford Institute of Materials and Energy Sciences reported that solar energy devices based on photo-enhanced thermionic emission (PETE) chip performance could achieve 100 times more efficiency than prior models. Whereas conventional PV cells rely on specific sun spectrum wavelengths to generate energy, PETE applications use a semiconductor chip that enables the equipment to utilize the full solar spectrum, potentially increasing electrical output. Since high temperatures drastically improve thermionic emission, utility-scale concentrating solar power plants may combine PETE technology and sunlight-focusing mirrors to increase their electricity production by 50 percent. Solar panel technology continues to evolve as scientists and engineers explore new materials and designs. Electro-mechanical technicians who are versed in solar technology continue to be high in demand. RSI is committed to delivering educational resources that enable students to succeed in this rapidly growing sector.